Data migration is the process of organizing, restructuring, copying, and migrating data from your old ERP systems to your new solution. 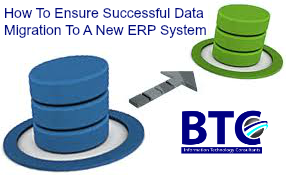 Businesses adapt Enterprise resource planning system to save time and to make better profits with their investment, but when it comes to new ERP System Data migration – from either an old ERP solution or another business system entirely – it can seem like there is a time-consuming challenge on the horizon. To make this process successful we have covered certain points in this article to ensure your business migrate data to a new ERP system with the speedy process. Master data – the core data that is essential for the operation of your business processes. It is a consistent set of attributes and identifiers that describe the different entities of your company, e.g. customers, products, suppliers, chart of accounts, etc. Historical data – collected data that is over two years old. Live/current data – all of your recent transactional data. So before making a decision, you need to decide which data is more important to migrating, so planning and analyzing is a very important step before implementation. Before migration from old ERP system to new ERP you must clean up the data and filter what can be used in the future and which things to discard. In this step vendors need to rethink and reaudit the data from the beginning and consider changing your processes and ask your new ERP vendor for recommendations – maybe there is room for improvement. End results with this step will be clean consistent data for future use. We at BTC ensures that everything is analyzed and well organized. Now here your company needs an in-house team of experts with technical skills to superhead this process. Normally this people should be an experienced staff with hands on this legacy system. To ensure successful data migration to a new ERP system UAE your business must know timeline that reflects the types of data, the amount of data, the necessary changes to be made, etc. Do make sure to also have contingency plans for delays – unforeseen issues are more likely to arise than not. In the case of early migrations, you should ensure there is a way of manually updating this data if needs are before the new ERP system is live. Then there are some types of data which give you more flexibility, such as historical sales records which are unlikely to change. After finishing the above step, now its time to test the data. Testing should be done for the small amount of data before uploading everything at once. This gives you the clear view of speed and everything that needs to be fixed more. This is a key step in catching problems and tackling them before they get prominent. Converting old ERP system to a new ERP system is never easy, and data migration is one of the more complicated parts of the process. Planning ahead and defining a strategy for the process will save your time and increase productivity for the project.